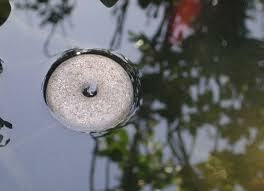 Mosquito Dunks can be used in all types of standing water sites where mosquito larvae grow before becoming adults. Alternate wetting and drying will not reduce their effectiveness. To prevent dunks from being washed away, anchor them using a string tied through the center hole, or they can be staked in place. 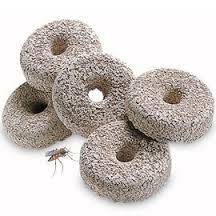 Mosquito dunks contain no poisonous chemicals and are harmless to other living things. Each Dunk of Bti treats 100 sq.ft of water surface regardless of depth. Mosquito larvae will feed on them and will be killed continuously. You will then be rid of biting adult mosquitoes for the entire season. Mosquito dunks, which dry out will start working again when they become wet. Unused dunks will remain active indefinitely. The floating action of the briquets will ensure that active material is released at the surface as well as gradually settle to the bottom. The floating Briquet formulation releases effective levels of B.t.i at the waters surface for a period of 30 days or more. Summit B.t.i. Briquets remain in the water column where mosquito larvae feed, to give you continuous kill. Summit B.t.i. Briquets release a constant, low dose of B.t.i, so early instars may survive temporarily. However, continuous ingestion of the active ingredient produces a chronic infection which kills the larvae. So you will not observe pupae, and the adult mosquitoes will not emerge. Dunks also can be used as a pre-flood treatement in areas expected to become breeding sources.